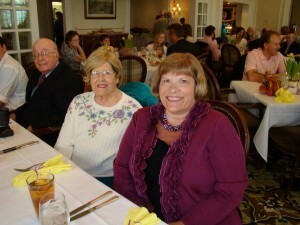 Bev Kent, center, was photographed on Easter Sunday, 2012. Her oldest daughter, Becky Kent Woolman, is at right and her husband, Dr. Homer A. Kent, Jr., is at left. Beverly Kent, wife of former Grace College and Theological Seminary president Homer A. Kent, Jr., went to be with the Lord about 5 p.m. today. She had been in ill health for the past several years and was hospitalized over the weekend for congestive heart failure. More details will be released as they become available. Mrs. Kent, originally from southern California, had a long and storied career in Winona Lake, Indiana, as her husband’s career progressed through being New Testament and Greek professor at the seminary, then as first lady when he was president, and later, in retirement. Mrs. Kent was well-known as a soprano soloist and voice teacher, having taught hundreds of Grace College students. She was very active at Winona Lake Grace Brethren Church, where she participated in the three-fold communion service as recently as July 8. We wish to express our condolences to the family at this time of your loss and pray that God's Spirit will comfort you. We wish to express our sincere sympathy to Beverly's family. She was my (Gayle's) voice instructor in mid 60's and I always had great respect and affection for her. Praying! So sad to hear of our loss with Mrs. Kent's homegoing. But thrilled that she can sing soprano in the Lord's chorus. I so enjoyed hearing her sing to the Lord while attending WLGBC many years ago. May God the Holy Spirit bring comfort to the family and te church.